[165 Pages Report] According to the new market research report, the UV curing system market was valued at USD 2.74 Billion in 2017 and is expected to reach USD 5.45 Billion by 2023, at a CAGR of 10.66% between 2018 and 2023. The base year used for this study is 2017, and the forecast period is between 2018 and 2023. To define, describe, and forecast the overall UV curing system market, in terms of value and volume, segmented on the basis of technology. 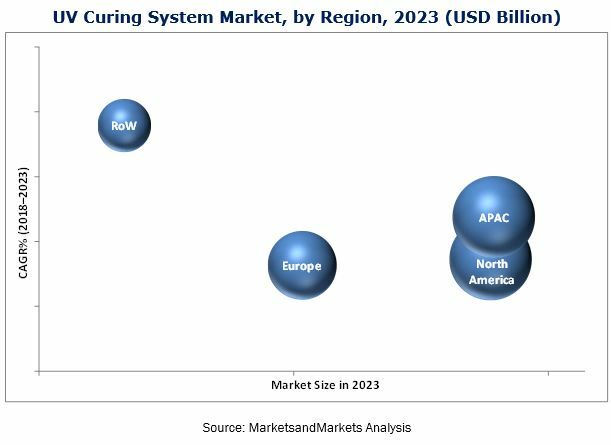 To define, describe, and forecast the overall UV curing system market, in terms of value segmented on the basis of type, pressure, end-user industry, and application. To estimate the size of the UV curing system market, top-down and bottom-up approaches have been considered in the study. This entire research methodology includes the study of annual and financial reports of top players, presentations, press releases, journals, paid databases, associations such as RadTech Europe Secretariat, UV LED Curing Community, Radtech International, The International Ultraviolet Association (IUVA), UV LED Curing Association, LED-UV Association, and interviews with industry experts. 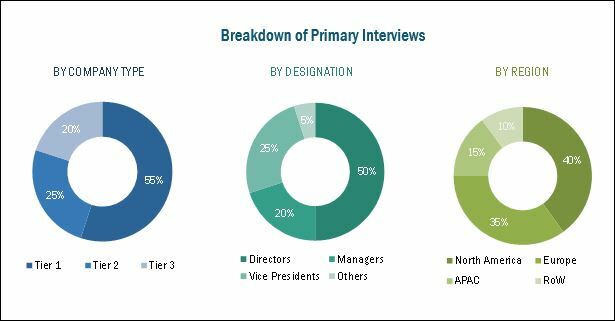 The top-down approach was used to estimate the overall UV curing system market from the addition of estimated market sizes of all the segments via percentage splits from secondary and primary research. The UV curing ecosystem comprises companies such as Dymax (US), Nordson (US), Baldwin Technology (US), Heraeus (Germany), Phoseon (US), Honle (Germany), Panasonic Corporation of North America (US), Delo (Germany), IST METZ (US), and American Ultraviolet (US). This report also covers the following prominent players: Omron (Japan), Excelitas (US), Uvitron (US), Atlantic Zeiser (Germany), Benford UV (Shire county), GEW (EC) (England), Hanovia (UK), Miltec UV (US), Thorlabs (US), and Hoya (Japan). Further breakdown of the Rest of APAC can be provided for UV curing system market into South Korea and Malaysia. Further breakdown of RoW can be provided for UV curing system market into Brazil and Argentina. *Details on Business Overview, Products Offered, Recent Developments, Key Relationships SWOT Analysis, and MnM View Might Not Be Captured in Case of Unlisted Companies.